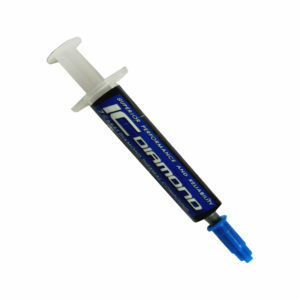 High Performance Thermal Interface Alternative to Thermal Compound for CPU’s, GPU’s and Gamestations. Temperature operating range -200 C to +400C. 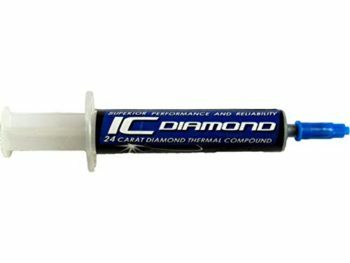 Extraordinary durability – Dry solution, contains no liquids so can not pump or bake out like a thermal paste. Modular solution – No guessing application amount. Turn off system and remove sink. Throughly clean sink and CPU and/or GPU of all grease or oils. 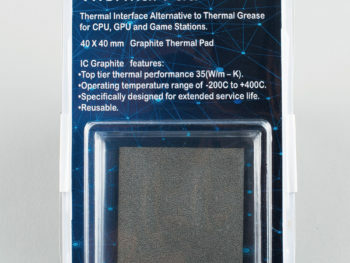 Place pad on dry CPU surface. Mount sink as you normally would. 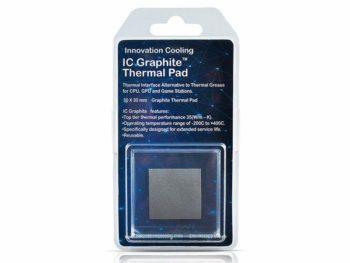 Caution: IC Graphite is electrically conductive! Any contact with electrical components when the computer is turned on can permanently damage the components. Please ensure that the system is turned off during the application process and that no stray pieces are contacting any components before powering on the system. The statements and technical information contained herein are based on tests and data which Innovation Cooling believes to be reliable, but the accuracy or completeness of such statements and technical information is not guaranteed. 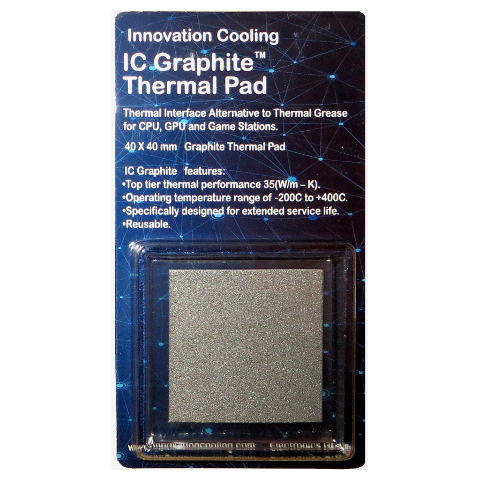 User is responsible for determining whether a specific Innovation Cooling product is fit for a particular purpose and suitable for user’s method of application. Please remember that many factors can affect the use and performance of an Innovation Cooling product in a particular application. The materials to be bonded with the product, the surface preparation of those materials, the product selected for use, the conditions in which the product is used, and the time and environmental conditions in which the product is expected to perform are among the many factors that can affect the use and performance of an Innovation Cooling product. 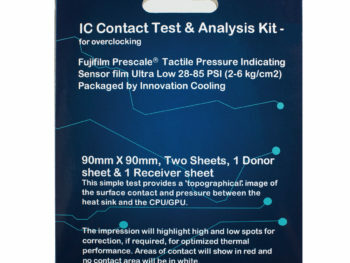 Given the variety of factors that can affect the use and performance of an Innovation Cooling product, some of which are uniquely within the user’s knowledge and control, it is essential that the user evaluate the Innovation Cooling product to determine whether it is fit for a particular purpose and suitable for the user’s method of application. INNOVATION COOLING LLC MAKES NO WARRANTIES, EXPRESS OR IMPLIED, INCLUDING BUT NOT LIMITED TO, ANY IMPLIED WARRANTY OF MERCHANTABILITY OR FITNESS FOR A PARTICULAR PURPOSE. If the Innovation Cooling product is proved to be defective, THE EXCLUSIVE REMEDY, AT Innovation Cooling’s OPTION, SHALL BE TO REFUND THE PURCHASE PRICE OF THE DEFECTIVE Innovation Cooling product. Innovation Cooling shall not otherwise be liable for loss or damages, whether direct, indirect, special, incidental, or consequential, regardless of the legal theory asserted, including, but not limited to, contract, negligence, warranty, or strict liability.